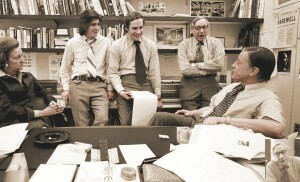 The Washington Post’s Watergate team, including from left to right, publisher Katharine Graham, Carl Bernstein, Bob Woodward, Howard Simons, and executive editor Ben Bradlee. There was a time when the Washington press corps prided itself on holding the powerful accountable – Pentagon Papers, Watergate, Vietnam War – but those days are long gone, replaced by a malleable media that puts its cozy relations with insiders ahead of the public interest, writes Robert Parry. publicadas por Carmelo Ruiz a la/s 10:38 a.m.